The extended Home screen (just Home screen, for short) on the Galaxy S 4 is the first screen that you see when the phone is done setting up. Samsung has set it to be five screen-widths wide and one screen high. At any given moment, of course, you see only one screen at a time. The extended Home screen is where you can organize icons and other functions to best make the phone convenient for you. Out of the box, Samsung and your cellular carrier have worked together to create a starting point for you. Beyond that, though, you have lots of ways that you can customize your Home screen so that you have easy access to the things that are most important for you. To start, check out the layout of the Home screen and how it relates to other areas of the phone. Knowing these areas is important for basic navigation. The notification area: This part of the screen presents you with small icons that let you know if something important is up, like a low battery. The primary shortcuts: These five icons remain stationary as you move across the home screen. 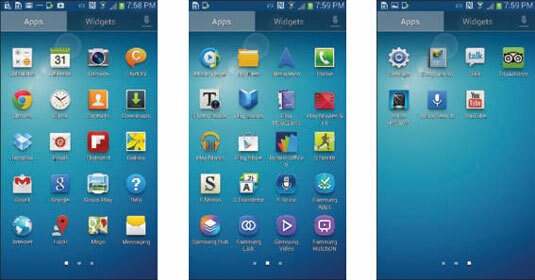 Samsung and your cellular carrier have determined that these are the four most important applications on your phone. The Device Function keys: These three keys control essential phone functions, regardless of what else is going on at the moment with the phone. There are a series of dots just above the primary shortcuts on the extended home screen. You may also notice that one of the dots isn’t just a dot — it is a little house icon. That is the “home” Home screen. The largest dot indicates where you are among the screens. You can navigate among the screens by dragging the screen to the left or right. This moves you one screen at a time. You can also jump multiple screens by tapping on the dot that corresponds to the screen number you want to see, or by dragging the dots to the screen you want to see. Keep reading for more detail on each area. From the extended Home screen, tap the Menu button. This brings up a pop-up at the bottom of the screen. Tap the Add Apps and Widgets button. The screen either displays all the icons of all the apps you currently have on your phone or it shows all the widgets you currently have on your phone. You can see all the apps by sliding around the apps screens. If you want to see widgets instead, tap on the word Widget towards the top of the screen. It appears slightly grayed out. This takes you to the Widgets screen. Slide your finger across the screen to bring up the different Widgets screens. Say that you put the shortcut on the wrong screen. No problem. You can press and hold it, and then drag it left or right until it’s on the screen you want. Taking a shortcut off your Home screen is simple. Press and hold the shortcut on the screen. A garbage can icon will appear at the top of the screen. Simply drag the doomed shortcut to the garbage can. It is gone, but if you made a mistake, you can get it back easily enough. To re-create it, simply go back to the App Menu key and follow the process again.